Difference between revisions of "Sleeping at Noisebridge"
There is broad consensus that living at Noisebridge or sleeping overnight is not excellent. That means you should not do it. Noisebridge is a place for hacking on creative uses of technology, not somewhere to live or crash out. Our lease prohibits people from living here, and people living at Noisebridge reduce its utility for those who want to hack. The nature of creative work means it doesn't always pan out financially. This is pretty serious in San Francisco due to its high cost of living. Noisebridge offers [[starving hackers|a list of resources for starving hackers]], both on dead trees in meatspace and on this wiki. The experimental [[Hacker Stacker Napping Pods]] were built in April 2013 to provide a place for taking short occassional naps. Please do not misuse them! 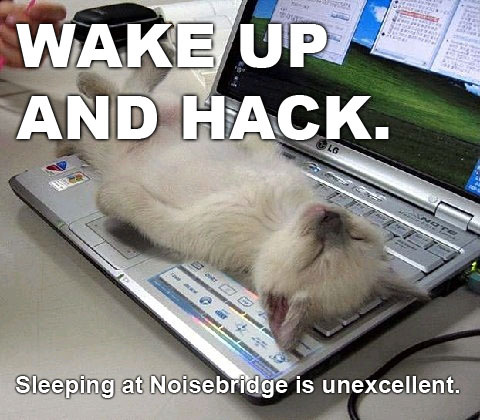 If you are sleeping at Noisebridge anyone has the right to ask you to wake up and hack or leave. As a community, we agree that it is not acceptable to argue, be rude, or go back to sleep after someone has asked you to wake and hack or leave. If you fail to wake up and hack or leave when asked, you should expect to have your behavior discussed at a community meeting, and you are likely to end up being unwelcome here. The experimental Hacker Stacker Napping Pods were built in April 2013 to provide a place for taking short occassional naps. Please do not misuse them!